The Goðafoss (Icelandic: waterfall of the gods or waterfall of the goði) is one of the most spectacular waterfalls in Iceland. It is located in the Mývatn district of North-Central Iceland at the beginning of the Sprengisandur highland road. Waterfalls are often formed when a river is young. At these times the channel is often narrow and deep. When the river courses over resistant bedrock, erosion happens slowly, while downstream the erosion occurs more rapidly.As the watercourse increases its velocity at the edge of the waterfall, it plucks material from the riverbed. 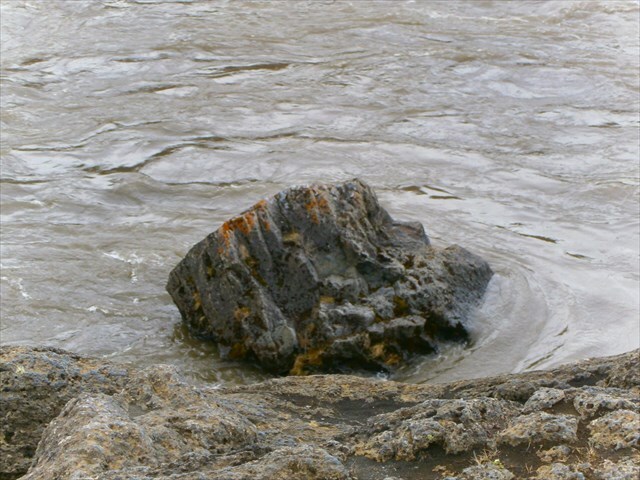 Whirlpools created in the turbulence as well as sand and stones carried by the watercourse increase the erosion capacity. This causes the waterfall to carve deeper into the bed and to recede upstream. Often over time, the waterfall will recede back to form a canyon or gorge downstream as it recedes upstream, and it will carve deeper into the ridge above it. The rate of retreat for a waterfall can be as high as one and half meters per year. A river sometimes flows over a large step in the rocks that may have been formed by a fault line. Waterfalls can occur along the edge of a glacial trough, where a stream or river flowing into a glacier continues to flow into a valley after the glacier has receded or melted. The river which created the Goðafoss is called Skjálfandafljót. It has its source at the northwestern border of the icecap Vatnajökull on the Highlands of Iceland. From there it streams parallel to the Sprengisandur highland road in northern direction, flowing finally into Skjálfandi bay. It runs across a lava field which is approximately 7000 years old. Through the ages the river has dug about 3 km up through the lava field a canyon which just below the falls is about 100m wide. Rocky promontories in the horseshoe shaped edge of the falls divide it into two main falls and a few smaller one, depending on the flow. The Goðafoss is one of the most spectacular waterfalls in Iceland. The water of the river Skjálfandafljót falls from a height of 12 meters over a width of 30 meters.The special is that the waterfall has the shape of a horseshoe. 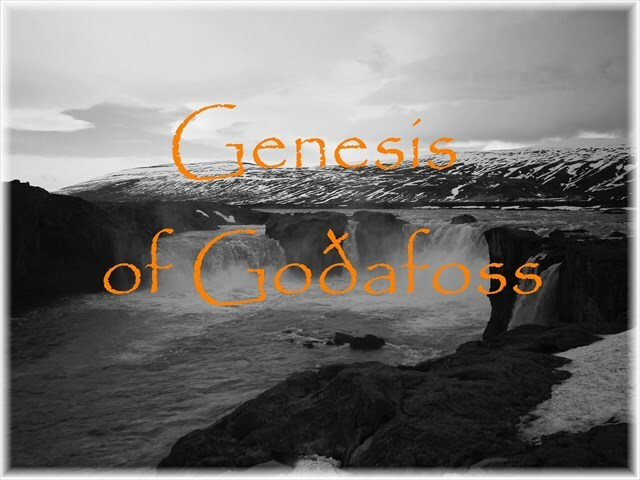 Goðafoss is closely connected with one of the most important event in Icelandic history, the conversion to Christianity from heathendom or “the old custom” in the year 1000. At that time Þorgeir Þorkelsson, chieftain from nearby Ljósavatn was lawspeaker in Iceland. As such he was faced with the task of settling the growing disputes between Christians and those who worshipped the old Nordic gods. Despite being a heathen priest himself, he decided that all of Iceland should be Christian, as is famously recorded in the Sagas. Legend has it that, once he returned back to Ljósavatn from this historic Alþingi, he dispensed of his heathen gods by throwing them into the falls in a symbolic act of the conversion. This, according to the legend, is how Goðafoss got its name. Describe the size of the waterfall. Then estimate how much square meters, the waterfall has increased in the last hundred years and why.Explain what observations lead you to this conclusion. Referring to the listing: In which direction the waterfall will move in the future ? In the directon of the ringroad or in the direction of the highland? Explain your answer. Watch the water closely. Is it more clear or brown. What do you think is the reason for your observation? A photo at the given coordinates would be nice, but is optional!